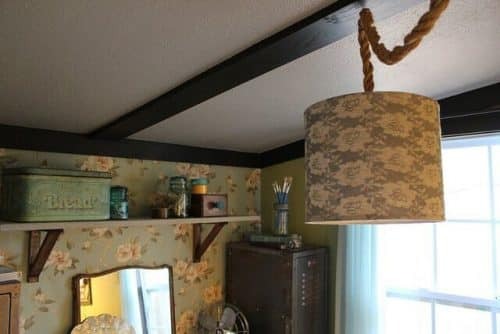 The best home décor is homemade décor! It gives your home a more personal feel and you can create items the exact way that you want them. Today I’m going to teach you how to make your own lace lamp shade. A lace lamp shade is perfect for shabby chic styled rooms. It’s really simple to make and will look beautiful in your bedroom or living room. Take your purple lamp shade and set it down on some cardboard outside or in the garage. Your piece of lace should be large enough to wrap around and cover the whole surface area of the lamp shade. If possible, make the ends of the lace meet up evenly to complete the pattern. If it’s not possible, don’t worry, this can be the back of your lamp shade. Use scotch tape to secure the lace. You don’t want the lace to move at all when you start spray painting. Not I like gray with purple the best, but if you can’t find gray spray paint, white would also make an elegant lamp shade. Take your desired color and thoroughly spray paint all the way around your lamp shade. When you are sure that you’ve covered all the open surface area around the lamp shade, remove the lace. Then place your brand new lamp shade on its stand and display it in your home!
. All you need is a white lamp shade, a zebra print stencil and black spray paint to create a zebra lamp shade.